Excalibur lands in a pulpy alien world. In a bar filled with strange creatures, an unnamed narrator tells the story of how Nightcrawler fell from Excalibur's train, landing on a skyship in the midst of a pirate attack. Siding with Anjulie, the woman seemingly being attacked, he fights off the pirates, but is knocked out from behind by Anjulie. Meanwhile, Rachel and Kitty awaken, powerless, inside a smokehouse. Kitty uses her martial arts training to free them, just as an alien cook arrives to kill them. They knock out the cook, but the fight spills out into a restaurant where a band of warriors is dining. Impressed by Rachel and Kitty, they induct the women into their confederacy. 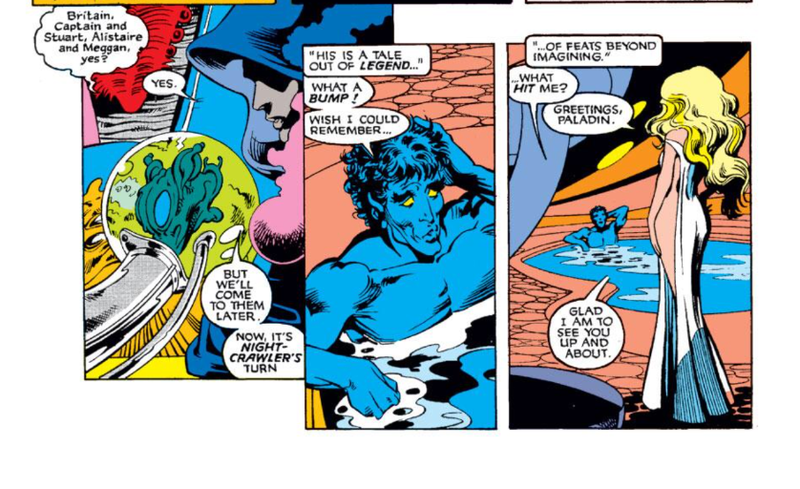 Meanwhile, Nightcrawler awakens in a bath along with Anjulie, who is quite affectionate towards him, though Nightcrawler grows suspicious of the woman. Elsewhere, Alistair is chased by a group of bounty hunters, but is rescued by Kitty and Rachel. However, they are soon captured by a skyship flying overhead. Aboard that ship, Nightcrawler secretly follows Anjulie to the dungeons, where he finds the Kymri, pirate captain he defeated earlier, and learns the truth about Anjulie. Together, they follow Anjulie to her master, a large tentacled creature feeding on the rest of Excalibur. 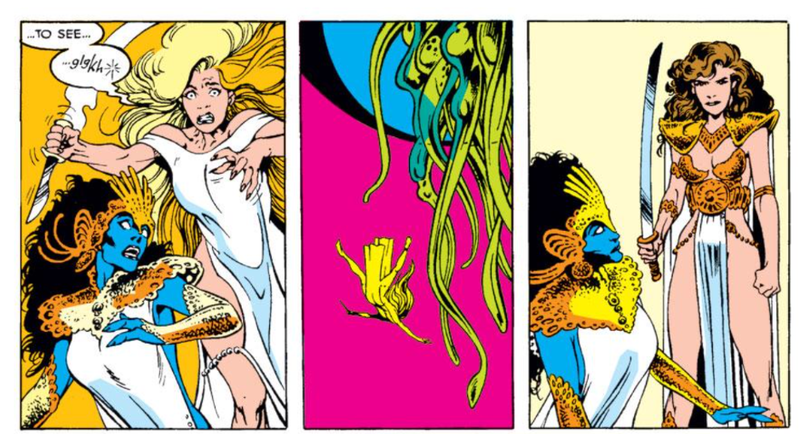 Nightcrawler is able to free Rachel and Kitty, and when Anjulie attempts to kill Kmyri, Kitty is forced to kill Anjulie. Realizing the creature seems to be afraid of Rachel, Nightcrawler reasons her power may be able to overload it, and tosses her into its mouth. A desperate gambit, the narrator affirms as her story pauses, as it runs the risk of giving the creature access to all the power of the Phoenix. The world of this story is generally based on early pulp sci-fi novels, specifically Edgar Rice Burroughs' Martian Chronicles, though I didn't notice any specific or overt references to anything in particular. Then again, my knowledge of that material is spotty, at best, so if anyone knows otherwise, speak up. Kitty kills Anjulie in this issue, an act, I'm led to understand, which will haunt her moving forward. Kitty references her ninja training, from the Kitty Pryde & Wolverine limited series. She also ends up in another risque outfit, though she's more embarrassed by this one. After the previous issue, which broke away from the usual "Cross Time" formula and teased an ending to this storyline, we're back to business as usual in this issue, as Excalibur once more finds themselves scattered in a strange world. And whereas previous "Cross Time" worlds had at least a theoretically intriguing hook ("Modern England but with magic! ", "Superhero Dystopia! "), the world of this issue is seemingly just a generic pulpy sci-fi mashup, an excuse for Nightcrawler to do a bit of swashbuckling. It doesn't even follow on all that overtly from the end of the previous issue, which teased a sudden end for Excalibur on their latest world, and we're still stuck hanging out in this world heading into the next issue. The Davis art is nice, of course, and, if we want to be charitable, there's maybe an interesting kernel to the idea that mutant powers have a touch of magic to them (which is why their powers are being suppressed on this world by Anjulie's tentacled master), but this is pretty much just a return to boring, pointless form for this storyline at a time when it desperately needs to be going somewhere or saying something interesting. Tomorrow, Wolverine fights Roughhouse in Wolverine #18. Next week, Uncanny X-Men #256 and New Mutants #84. Funny, I actually liked this one. It was probably the high point of "Cross-Time" for me, mainly due to the larger-than-normal focus on Nightcrawler and the delightful Davis cheesecake. Also, I love that the word "warlord" on the cover is from the logo of Marvel's "Warlord of Mars" series from the seventies (on which young Chris Claremont did some writing). 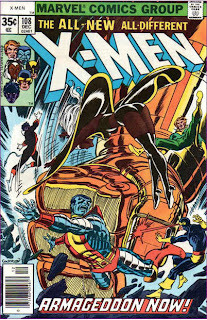 Trivia: This is one of eight single issues Claremont hand selected for his own X-Men Visionaries volume. Kymri appears in Claremont's X-Men: The End. There is a male alien character named Kymri in Claremont's prose novel, published in 1991, Grounded. "It was probably the high point of "Cross-Time" for me, mainly due to the larger-than-normal focus on Nightcrawler and the delightful Davis cheesecake." The Kitty cheesecake is just creepy, though, considering that she's supposed to be 15, especially considering that Davis doesn't draw her flat chested in this arc. Actually, she will celebrate her 15th birthday in a future issue, so she's actually 14 here. "Kitty kills Anjulie in this issue, an act, I'm led to understand, which will haunt her moving forward"
Or to be more accurate, an act which Claremont forgets about for a decade and a half, and then tries to convince us that has been bothering her all along. Anonymous -- "The Kitty cheesecake is just creepy, though..."
Yeah, I was speaking in terms of Anjulie and Kymrie. I also liked this issue quite a bit due to the focus on Nightcrawler, genre goofiness, and Davis art. In fact, it's one of my favorite issues of the series, barring Davis's solo run. While it doesn't break new ground or comment too heavily on genre conventions, it's fun. 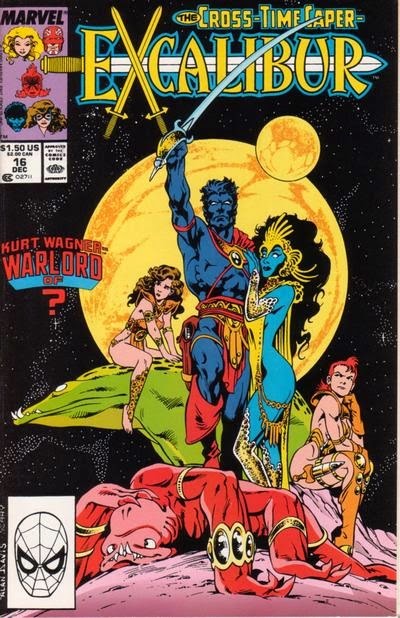 @Matt: Also, I love that the word "warlord" on the cover is from the logo of Marvel's "Warlord of Mars" series from the seventies (on which young Chris Claremont did some writing). That connection I did catch. Any others in the story itself I missed. @Jason: Trivia: This is one of eight single issues Claremont hand selected for his own X-Men Visionaries volume. Dang, I forgot that. I've been trying to call out the issues collected in that volume. My response to it aside, it's curious he picked this one of all the possible Excalibur/"Cross Time" issues. Maybe he especially liked the connection to his old "Warlord of Mars" work? @Anonymous: Or to be more accurate, an act which Claremont forgets about for a decade and a half, and then tries to convince us that has been bothering her all along. Good to know. When does he bring it up again (I honestly can't remember)? @Mike: While it doesn't break new ground or comment too heavily on genre conventions, it's fun. For me, I think it ultimately suffered coming after the previous issue, which was such a refreshing break from the usual "Cross Time" routine, and the fact that I spent much of it wondering if there were specific references to other things I was missing, rather than enjoying the story on its own merits. Tullamore Vogue’s slaver race first appears here, and there seemed to be a connection between his Hounds' and those from Rachel Grey's Days of Future Past experience, including the studded bonded costumes and facial tattoos. Fat Smurf Man is a bit like the Shadow King, too. Where Claremont was going with all these overlaps isn't clear. "Good to know. When does he bring it up again (I honestly can't remember)?" Overall, this is a fun, decent issue. I think the main problem is, at this point, much like the stories running along in X-factor and New Mutants, you have a certain fatigue setting in. There is definitely a feeling of "Well, yes, this is nice and all, but can we move along and get to the point, please?" Much like the XF and NM stories, I also feel this story would be better remembered had it to be trimmed down a bit. But at least with XF and NW, there is some sort of plot that is going. Here, the characters are just bouncing around from one dimension to the next, with no rhyme or reason, suggesting CC really had no idea what to do with this title, other than "Leftover X-character hanging out together based in Europe". I'm curious why it wasn't acknowledged in the story that Kymri and her pirate band are pointy-eared, fanged, and the same color as Kurt (apart from on the cover). Dunno if they're fuzzy like him, since you can't tell from looking; we only know he's a "fuzzy elf" 'cause we've been told. I'm no expert on the stuff either but I think they're known as the Chronicles of Mars (or even the Mars Chronicles, perhaps) rather than the Martian Chronicles, which was the title of a Ray Bradbury book turned into a TV miniseries that creeped me out at 9 years old. Anyway, outside of that usage of the logo for Marvel's John Carter, Warlord of Mars series, I didn't really notice any direct similarity to what little of the Burroughs stories I know. Being that I was nearly 15 when this issue came out, I'm going to excuse myself from any creepiness in admitting that at the time, the Kitty "cheesecake" didn't bother me.